The asteroid Spirit travels in a path that is tilted 8 degrees from the plane of the solar system. 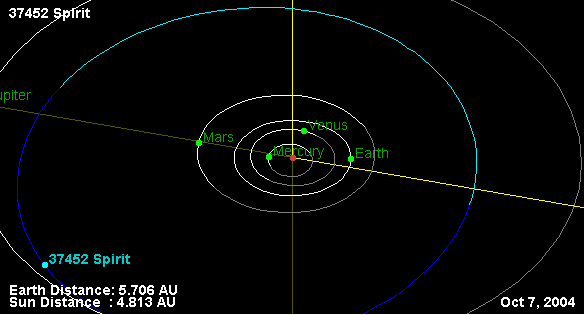 Click here to see an animation of the asteroid's orbit. Though they've never seen an asteroid, NASA's two robotic geologists have contributed so much to planetary exploration during their journeys across Mars that two asteroids have now been named after them. The rovers are the first planetary missions to be so honored. "I think it's cool!" said Jim Erickson. "I think everyone on the mission feels that way. Those are our rovers. When something is named after them, we all get the honor. And those rovers deserve respect." Erickson is project manager for the Mars Exploration Rover Mission at NASA's Jet Propulsion Laboratory in California. The asteroids, named Spirit and Opportunity after NASA's Mars Exploration Rovers, were discovered on Sept. 24, 1960 by Ingrid van Houten-Groeneveld, Cees J. van Houten, and Tom Gehrels. The trio spotted the moving masses of rock on photographic plates of the night sky taken with telescopes at Caltech's Palomar Observatory. Both rovers have now been exploring Mars for almost three times as long as originally expected. The asteroid Opportunity travels in a path that is tilted 3 degrees from the plane of the solar system. 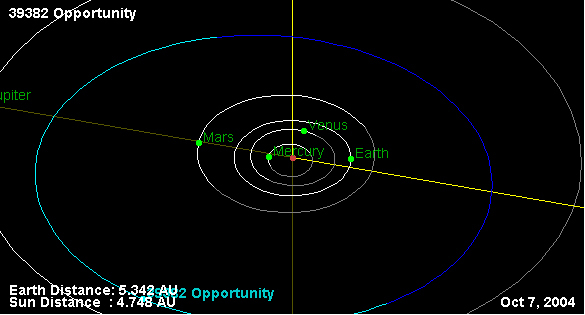 Click here to see an animation of the asteroid's orbit. It took more than 40 years to name the asteroids Spirit and Opportunity because both are quite faint. International Astronomical Union rules require asteroids to be observed during four separate cycles around the Earth and sun before they become eligible for numbering and naming, explained Ron Baalke, a software engineer at JPL. The more observations, the more precisely scientists can calculate the orbit. Baalke works in NASA's Near Earth Objects program, where he helps track and calculate the orbits of asteroids to identify those whose paths cross that of the Earth. Spirit has a diameter of 4 kilometers to 9 kilometers (2.5 miles to 5.6 miles) and Opportunity has a diameter of 3 kilometers to 7 kilometers (1.9 miles to 4.4 miles). Van Houten-Groeneveld, who lives in the Netherlands, proposed the name recently after the asteroids were assigned an official number in 2002. Both asteroids take 7.9 years to complete one orbit around the sun between Mars and the mammoth gaseous planet Jupiter. Neither follows a path that crosses the orbit of other planets and neither will be knocked out of orbit by the immense gravitational force of Jupiter. They belong to a small group of asteroids known as the Hilda group that have a 3:2 orbital resonance with Jupiter. This means that each time Jupiter completes two orbits around the sun, the asteroids complete three. The honor renders the two Mars rovers immortal in the sense that the asteroids are in stable orbits that will last for thousands of years.